TOKYO, Jan 11, 2019 - (JCN Newswire) - Mitsubishi Shipbuilding Co., Ltd., a Group company of Mitsubishi Heavy Industries, Ltd. (MHI) based in Yokohama, held a christening ceremony today for a next-generation LNG (liquefied natural gas) carrier under construction for TRANS PACIFIC SHIPPING 5 LTD., a joint venture of JERA Co., Inc. (JERA) and Mitsui O.S.K. Lines, Ltd. (MOL). 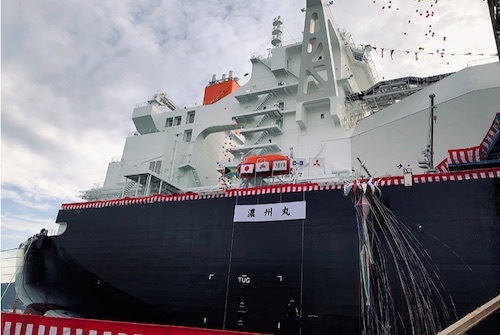 The new ship, named NOHSHU MARU, is the fourth vessel of the latest model "Sayaringo STaGE" type, featuring significant improvements in both LNG carrying capacity and fuel performance due to the adoption of a more efficient hull structure and an innovative hybrid propulsion system. Completion and delivery is scheduled for February 2019, after which the NOHSHU MARU will be put into service, transporting LNG for the Freeport LNG Project in the U.S. state of Texas (in which JERA is participating), among other ventures. The christening ceremony, held at the Koyagi Plant of MHI's Nagasaki Shipyard & Machinery Works, was attended by representatives of the ship owner, along with many other guests. Chubu Electric Power President, Satoru Katsuno, announced the name of the ship, while his wife performed the ceremonial rope cutting. The NOHSHU MARU has a length of 297.5m, width of 48.94m, and depth of 27.0m, with a draft of 11.1m. Deadweight tonnage is approximately 80,300 tons, with total tank holding capacity of 180,000m3. Launching took place on October 9, 2017. Mitsubishi Shipbuilding received the order for the new vessel from the owner, TRANS PACIFIC SHIPPING 5 LTD., through MI LNG Company, Limited, a joint venture for the design and sale of LNG carriers established by MHI and Imabari Shipbuilding Co., Ltd. Construction was managed by Mitsubishi Heavy Industries Marine Structure Co., Ltd., an MHI Group company based in Nagasaki. The vessel's name is derived from the old provincial name for the southern region of Gifu Prefecture, one of the areas served by Chubu Electric Power. The Sayaringo STaGE is a successor to the "Sayaendo," a vessel highly acclaimed for its reliability and innovatively refined MOSS-type spherical tanks. The use of apple-shaped tanks allows for greater LNG carrying capacity without increases to the ship's width, while the hybrid propulsion system further improves fuel efficiency over the previous model. STaGE, an acronym derived from "Steam Turbine and Gas Engines," is a hybrid propulsion system combining a steam turbine and gas-fired engines. Effective utilization of waste heat from the engines for the steam turbine provides a substantial improvement in plant efficiency, allowing for high-efficiency navigation in both low and high-speed areas. Going forward, Mitsubishi Shipbuilding and MHI Marine Structure will continue the development of next-generation LNG carriers with exceptional fuel efficiency and sustainable performance, in order to contribute to stable energy supplies and environmental conservation. Next-Generation LNG Carrier "NOHSHU MARU"